Via Newsvine, Texasguy01 unintentionally shines some light on some deficit obsessives still getting everything wrong. Terence Jeffrey picked up on revised figures from the Congressional Budget Office for spending and revenue between 1973 and 2012, and noted that budget deficits have exceeded $1 trillion in all four years of President Obama’s first term. Technically that’s true, but that has everything to do with the Great Recession and little to do with politicians in either party. And that’s not “the story”. The story now is plummeting budget deficits. To get a bit of civics 101 out of the way, most of 2009 spending (called FY2009) was set by a Democratic Congress and President George W. Bush in 2008 with the exception of the Recovery Act (split across 2009, 2010, and 2011), before the 2008 Presidential election took place. That’s how it always is. Congress has always passed budgets almost a full year in advance. It’s the same for every President in history. Most of 2001 spending ($32.4 billion deficit) was set by Bill Clinton and a GOP Congress, not George Bush. Bush’s first budget was 2002 ($317 billion deficit). Barack Obama’s fiscal budget years are now 2010-2017. Either President Clinton or President Christie won’t be deciding spending issues in their first year in office (2017) anymore than Obama, Bush, or Bill Clinton did. That’s important, because Bush’s final fiscal budget was the largest in history (unadjusted for inflation) in dollars, at $1549.7 billion. We can all thank the Wall Street bailout for that. Obama’s first fiscal budget was substantially smaller, $1370.5 billion. With the 2013 deficit projected to fall between $600 and $700 billion, Obama’s first four fiscal years will be $1.37 trillion, $1.36 trillion, $1.14 trillion, and $700 billion — a reduction every year he’s had a say in the budget. And it is just a say, Congress writes the budget and always has. These numbers are very large for two very good reasons. First, the United States is a big country that’s grown a lot over the past 20 years. The government was spending $1.38 trillion and taking in $1 trillion in 1992 for a population of 256 million. Now it’s closer to $3.5 trillion in spending and $2.4 trillion in tax revenue for 313 million people. That’s a 153% increase in spending, 140% increase in tax revenue, and a 22% increase in population (an additional 57 million people). For those who would say, Out of control spending!, that’s wrong. The rate of increased spending grew during the Bush administration but actually has been very stable over the past 20 years. It’s about a trillion higher right now than it would have been at the Clinton rate, and just about exactly where it would have been under the Bush rate. Second, that’s the wrong way to figure deficits anyway. 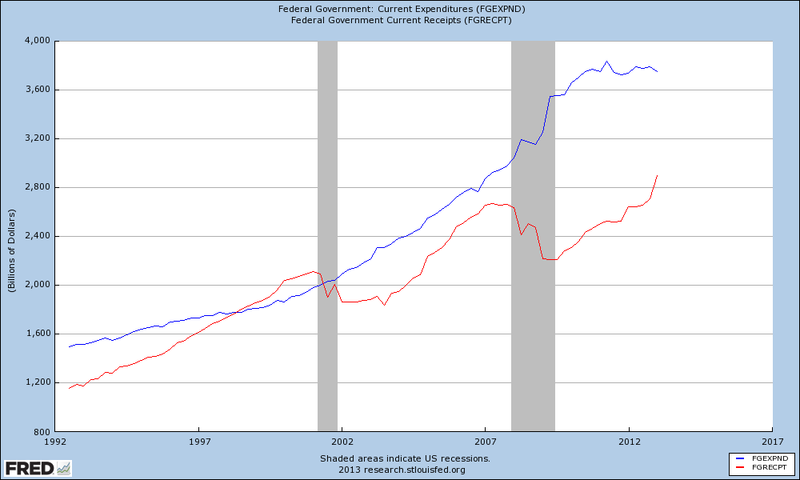 You don’t want to look at raw dollars any more than you want to figure the deficit as a percentage of spending. Even though the 2013 deficit will be nearly twice as big as the 1992 deficit, it’ll be a smaller chunk of the economy because the economy has grown so much over that time. So as a percentage of the economy, the 1992 deficit was actually larger than what we’ll have in 2013. 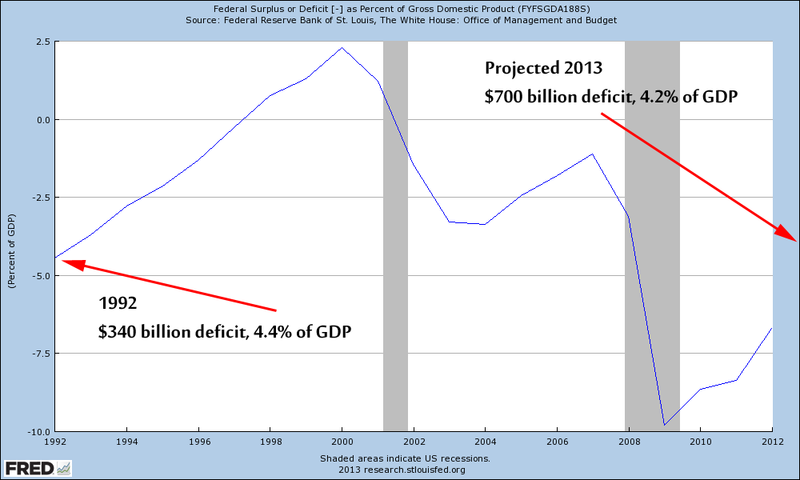 By 2014 the deficit would be the same share of GDP as some of first years of the Bush administration. The points to take away from this are that these massive deficits would have happened under President John McCain and President Mitt Romney, because they were the direct result of the Great Recession, not politics. The graphs show it clearly. And that the slow economic recovery is bringing the deficit back down. Lately by leaps and bounds. The $1100 billion to $700 billion fall between 2012 and 2013 will be one of the largst reductions in budget deficit in history. The $1500 billion to $700 billion fall between 2009 and 2013 is more than a 50% reduction in four years. Moreover, these numbers are nothing compared to the Great Depression. The deficit as a percentage of GDP in the ’40s nearly hit 30%. It didn’t quite hit 10% at the worst of the Great Recession and has been coming down ever since. Hate Obama all you want for political reasons, but don’t play games like this. It benefits no one.